The automaker said it now expects achieve an eight per cent global profit margin by 2020, two years sooner than planned. 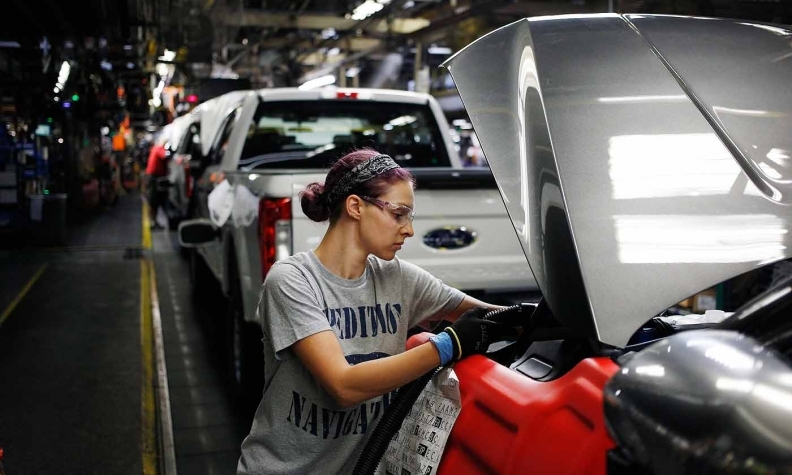 It upped its five-year cost-cutting goal to $25.5 billion (Ford reports earnings in U.S. dollars), from the $14 billion projected by CEO Jim Hackett in October. Ford CFO Bob Shanks announced the improved guidance as the company reported a nine per cent increase in first-quarter net income. Its global profit margin was 5.2 per cent in the quarter, as higher commodity costs reduced earnings in North America. The company posted a 6.4 per cent margin during the same quarter last year. He also said the company was reducing its planned capital spending from 2019 through 2022 by $5 billion to $29 billion through such actions as using common “modules” to account for 70 per cent of the value of each vehicle and reusing tools and equipment. In the first quarter, net income rose $144 million to $1.74 billion, and revenue grew 7.4 per cent to $42 billion. About $100 million of its income was due to a lower tax rate. Ford’s North American pretax profit fell 9.2 per cent to $1.94 billion, with commodity costs accounting for more than the entire decline. It lost $149 million in South America, 37 per cent less than in the first quarter of 2017, and earned $119 million in Europe, down 43 per cent. Its Asia Pacific business swung to a $119 million loss, from a $148 million profit a year ago. Ford Credit’s profit jumped 33 per cent to $641 million, while the automaker’s fledgling mobility ventures lost $102 million, 59 per cent more than a year ago.